Haris Epaminonda, Tarahi V, 2007. Video Installation. Created from extracts of kitsch movies or Greek soap operas from the 1960s, these videos are like audiovisual ‘postcards’ reflecting a nostalgic and melancholic approach. The images have lost their context and original meaning to then be re-assembled, confronted to each other and superimposed with other elements, to reveal new sequences. The narration has disappeared from the sequences and the spectator waits in vain for something to happen. In “Tarahi V”, the saturated colors of the sequences collected from 1960 films seem to give a new life to the characters (the little girl in pink with her doll, the couple walking backwards, etc.) 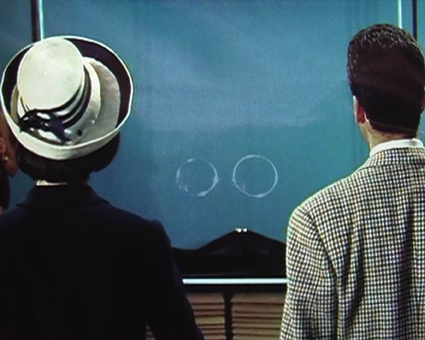 while the fireworks, superimposed throughout the film provide a disenchanting aspect to the whole scene. Recalling Hitchcock as well as René Magritte, “Tarahi V” presents a pending moment providing the shots and the characters with ghostly appearances. This feeling is reinforced by the piano arrangement creating tension throughout the whole sequence. The lighting, the colors and the particular rhythm of Haris Epaminonda’s films provide a strong radiant power. They are like traces of a fictionalized past permanently stuck in one’s memory. Haris Epaminonda’s films and collages belong to a fragmented art that questions the “in between”, a shifting moment leading to a new spatial and time-related sphere. Epaminonda’s video works are based on re-shot excerpts of film and television footage – principally the Greek soap operas and kitsch romantic films fromthe 1960s that used to fill up Sunday afternoons in the artist’s Cypriot childhood –which she then subtly reworks. Sometimes local celebrities appear in her films, but, in contrast to the early works of Francesco Vezzoli or T.J. Wilcox, they don’t do so in order to emphasize a phantasmal communion with their constructed identities. The scenes that she chooses to work with are not instantly recognizable from the original narrative, so the culled images are effectively stripped of their initial meaning and context. These out-takes are then edited and adapted in a variety of ways: the film’s speed and direction are changed, sections are distorted, its colour is intensified, or a poignant soundtrack is added. Most significantly, she also superimposes footage to make surreal composites: an indoor scene, say, might also have traces of fireworks glimmering through it. While these are all common manipulation techniques of digital video, Epaminonda uses them with captivating sensibility. Extract by Dominic Eichler (Frieze 111). Haris Epaminonda was born in Cyprus in 1980. She lives and works in Berlin, Germany.